I finally got a chance to hit a river since trout season opened. Water flow was excellent and the river was very clear. Only saw one other guy fishing downstream of me. There was a hatch of what looked to me like small stone flies coming off the river right before dark. I'm not 100% sure if that is what they were or not. They looked like stone flies but where on the small size. 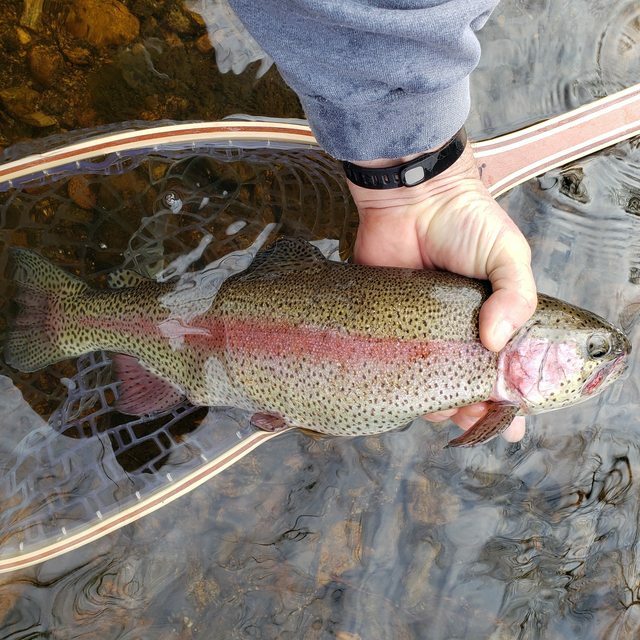 I only had about an hour or so but I was able to land one nice fat rainbow. I seed that fish on instagram....how are the frog's toggs working out? I'm really liking the Frogg Toggs. They seem real durable but yet light weight. The neoprene boots seem to be a little smaller in terms of width/height not length than other waders I have had which means less bunched up material in my boots! Nice fish! I have been seeing Hendrickson and a few blue quill mayflies and their spinners, grannom and at least one other caddis, and egg laying stoneflies (LBS) along with a few BWO mayflies at times locally. The Hendricksons have not hatched normally like from 3-5pm as is normal, but they seem to come off now and then throughout the day the last week since that hatch started. But last evening their spinners were flying, egg-laden, above the riffles on the SBR. Today's wind will kill any spinner fall action tonight. There's always tomorrow after 5pm for that river. Nice fish. I fished the FB Saturday morning. Water was brown and moving, wasn't expecting it to be so high, must of received more rain then projected. Managed six, a couple were nice size. When the sun came out late morning I saw a few Hendrickson coming off. Not enough surface activity to switch from nymphs. I caught that bow on a bead head pheasant tail nymph. I didn't see any fish rise for what I think was stone flies.